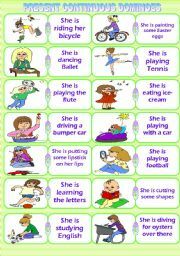 It is a worksheet mainly designed to make students review the simple past structures but it could be also useful to make students practice the error analysis since there are some sentences that have grammar mistakes.Cliparts were taken from a thumbplus cd. Have a nice Monday!! Huggies from Venezuela!! Thanks in advance for the comments left!! It is a worksheet designed to make students review mainly present continuous structures. Cliparts were taken from www. crativonline.org. Thanks in advanced for the comments left. 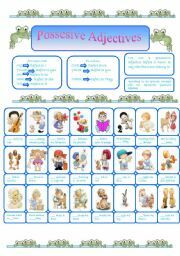 It is a worksheet designed to make students discriminate between the sentences given. 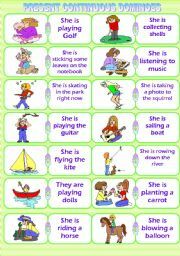 It is supposed students already learnt this vocabulary. Cliparts were taken form www. fotosearch.com. Have a nice week!! It is the second part of a series of present continuous dominoes. It is a great resource to make students review the structures taught. 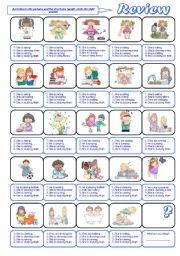 They can be laminated and used as a closing activity of a session class. Thanks in adavance for the comments left. Cliparts were taken from a thumbsplus cd. 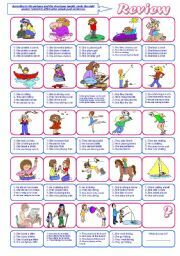 A worksheet designed to make students put in practice the greetings� spelling after a session class. Cliparts were taken from www. fotosearch.com.Thanks in advanced for the comments left. Have a nice weekend. It is another way to make students review present continuous structures. Cliparts were taken from a thumbsplus cd. Thanks in advance for the comments!! 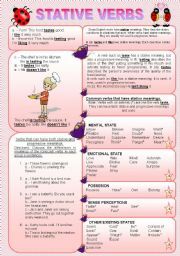 It is a ppp focused on describing love through Idioms. Hope it can be as useful as it was for me. I used a template downloaded from one member. 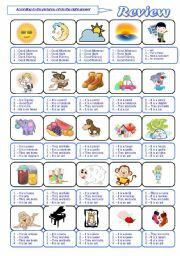 I add the link: http://www.eslprintables.com/powerpoint.asp?id=23737#thetop Enjoy it. Good luck! !